Aniruddha Mallik – Jarman International K.K. Favorite Thing About Living in Japan: I cherish the professionalism and honesty of the Japanese working environment. The commitment to time and quality is truly outstanding. 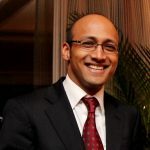 BIO: Aniruddha is the President & CEO of Agera Consulting, which he founded in 2013 after occupying executive management roles in companies of diverse business interests, ranging from information technology to education. Part entrepreneur, part mentor, part technology enthusiast, Aniruddha has more than 17 years of international business management experience. An avid photographer with a passion for travel and music, he has made Japan his home since 2000.